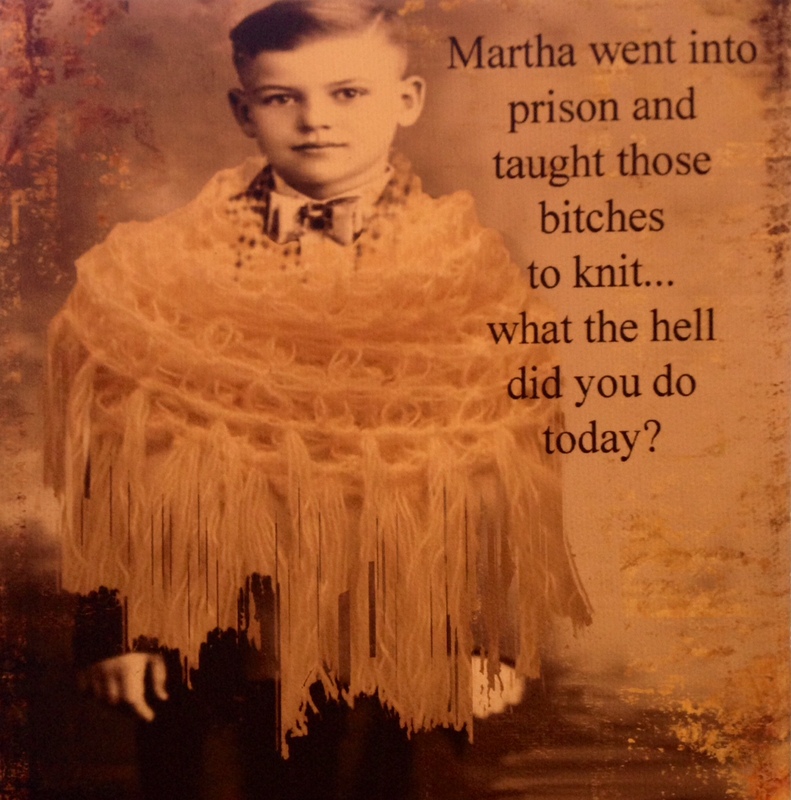 When I was in college I started watching Martha Stewart’s TV show, Martha Stewart Living. It wasn’t long until I subscribed to her “Living” magazine. While I loved the arts and crafts she did, many of the recipes were a bit difficult for me to make. They contained a lot of ingredients, many of which I didn’t even recognize! A few years later, she released the Everyday Food magazine. I was in heaven. The recipes were great, simple, and delicious! I loved them SO much I started tearing them out and creating one of the many recipe binders I have today. While I don’t currently subscribe to any of her magazines (I think I have subscribed to them all at one time or another), I still scrapbook recipes. I find it relaxing, filtering through the dozens of recipes in the recent issue of Cooking Light or Real Simple. So she went to jail. I never stopped loving her. Her recipes are just too good! This particular hummus recipe came from an old issue of Martha Stewart’s Whole Living, which I believe is no longer being published. I’ve made it a dozen times and am never disappointed! 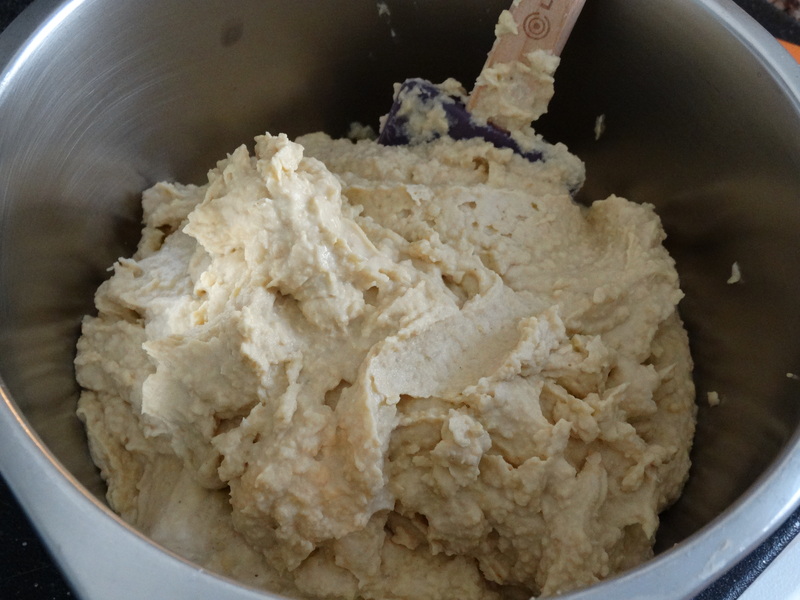 Homemade hummus is the best hummus. No preservatives or funny chemicals here! I made a double batch for a large group — you can definitely halve this recipe. Start by draining 2 15-ounce cans of chickpeas (also called garbanzo beans), reserving 1/2 cup of the liquid. Place the chickpeas, reserved liquid, 1/2 cup tahini, 1/2 cup fresh lemon juice (about 2 lemons), 2 tablespoons olive oil, 2 crushed garlic cloves, 1/2 teaspoon ground ginger, and 1/2 teaspoon ground cumin in a food processor. If you are doubling this recipe, as I’ve done here, I recommend using a full sized food processor. I tried using my small one and as you can see, it was very tight. Puree until smooth and transfer to a small mixing bowl. 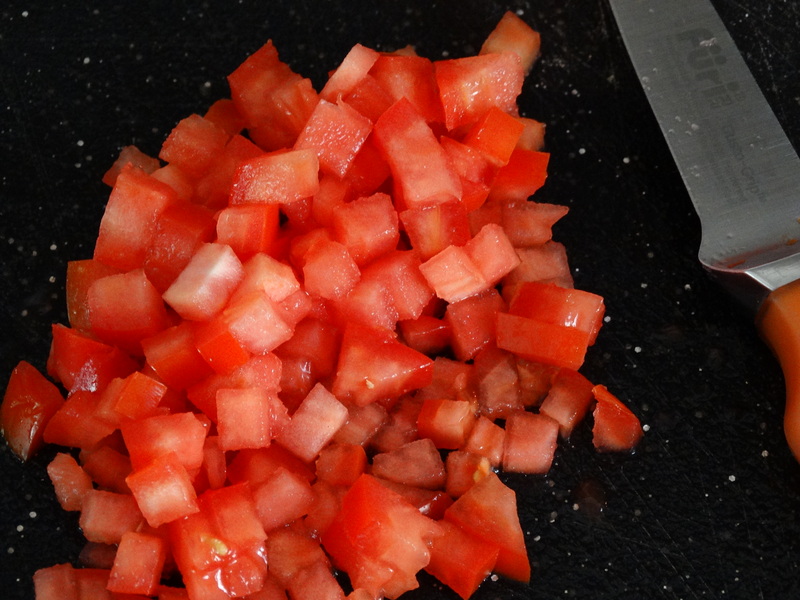 Finely chop one plum tomato, removing any seeds. Thinly slice the green ends of 2-3 scallions. Finely chop 1/4 cup of fresh cilantro. 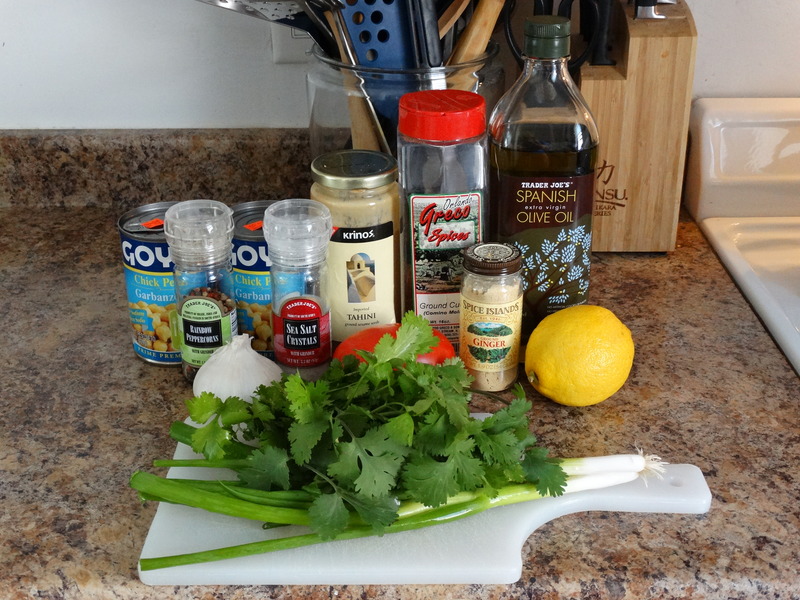 Add the tomatoes, scallions, and cilantro to your mixing bowl. Season with salt and pepper to taste. Stir everything together until well combined. Transfer the hummus to a small serving bowl. Drizzle a couple of tablespoons of olive oil over the top. You can serve this with fresh cut veggies, sliced pita bread, corn chips, or anything else you would like. Enjoy! Meet Tucie. She is a good little helper in the kitchen. 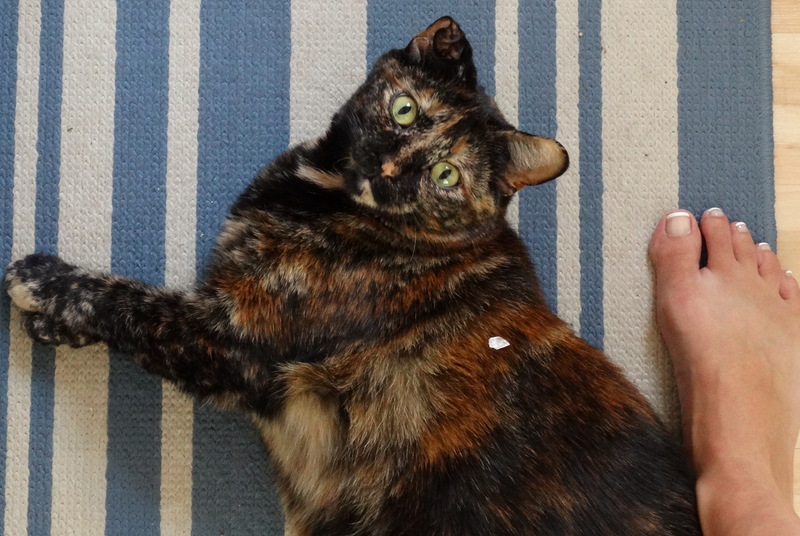 Here she is lying directly in front of my work area, rolling around in dropped garlic skins. I have to stand and step around her while trying to make my hummus. She “helps” often, lol! 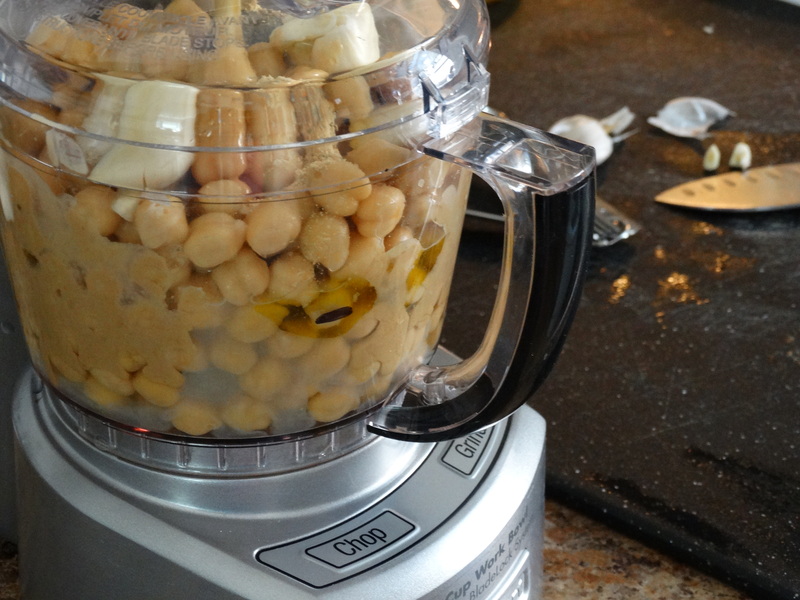 1) Drain 2 15-ounce cans of chickpeas, reserving 1/2 cup of the liquid. Place the chickpeas, reserved liquid, 1/2 cup tahini, 1/2 cup fresh lemon juice (about 2 lemons), 2 tablespoons olive oil, 2 crushed garlic cloves, 1/2 teaspoon ground ginger, and 1/2 teaspoon ground cumin in a food processor. Puree until smooth. Transfer to a small mixing bowl. 2) Finely chop one plum tomato, removing any seeds, and 1/4 cup fresh cilantro leaves. 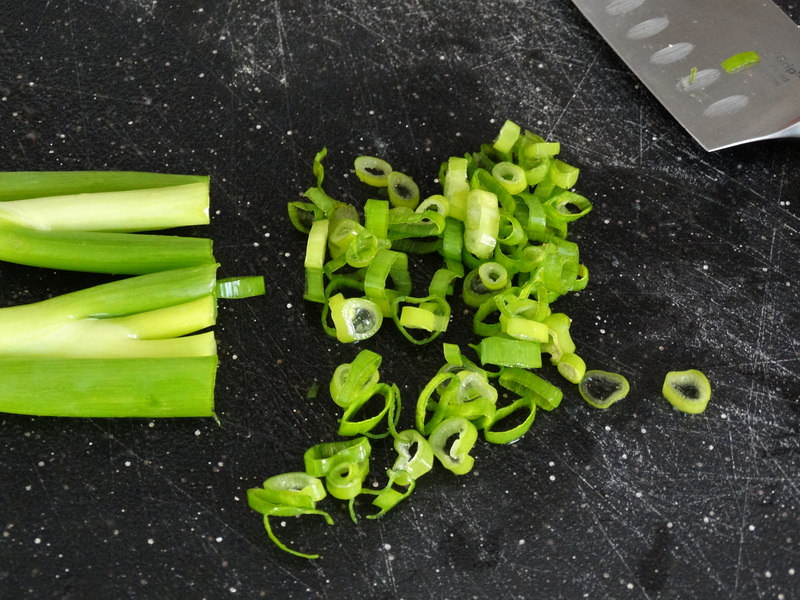 Thinly slice the green ends of 2-3 scallions. Add these to your mixing bowl. Add salt and pepper to taste. Stir to combine well. 3) Transfer to a small serving bowl and drizzle with 2 tablespoons of olive oil. Serve with fresh cut vegetables, sliced pita bread, or corn chips. Enjoy! 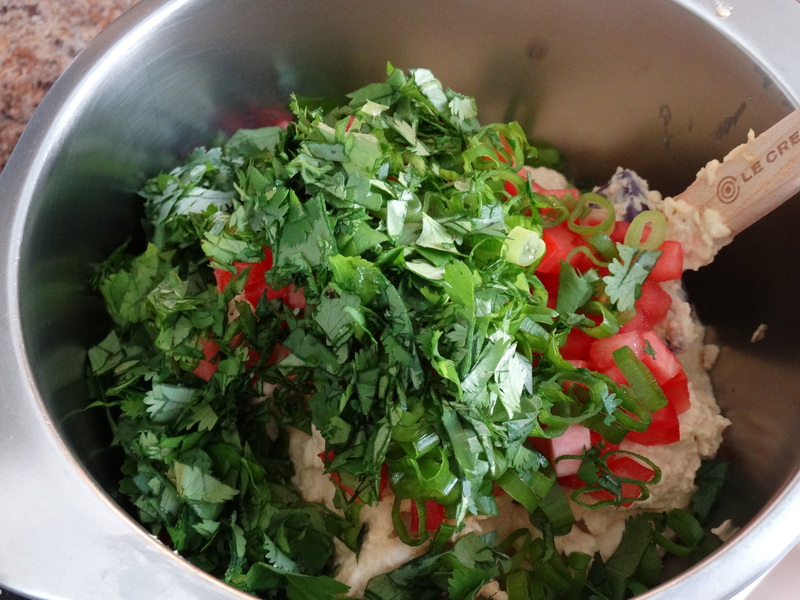 We are huge hummus fans….I can’t wait to try this recipe!!! 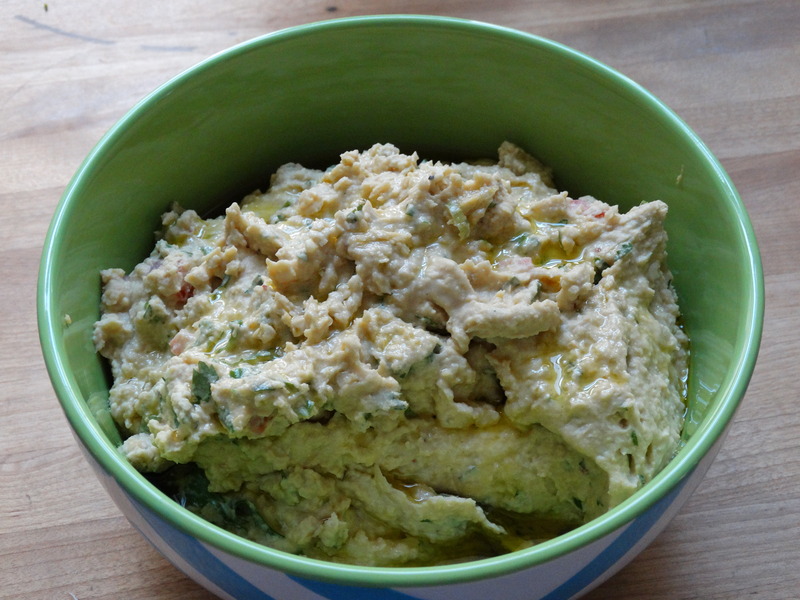 I got this recipe from you several years ago, and have never made any other recipe for homemade hummus! It is sooooooo yummy!